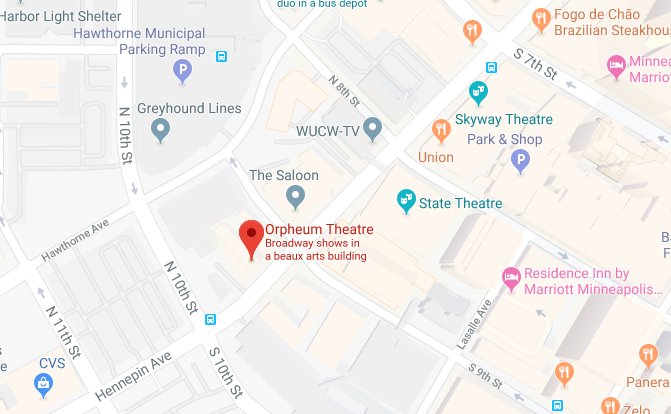 The Orpheum Theatre is accessible to all patrons. Guests with accessibility questions or who require additional assistance may email accessible@broadwayacrossamerica.com or call 612.339.7007. In 1988, the Minneapolis Community Development Agency purchased the Orpheum from singer Bob Dylan and his brother, David Zimmerman, who owned the theatre. Restoration began in 1993 and, to accommodate elaborate Broadway productions, the Orpheum stage was extended almost 20 feet, with the back wall of the theatre painstakingly removed brick by brick. Unexpected architectural discoveries made during the renovation of the lobby included six Pompeiian friezes previously hidden under velour curtains, fake window grids and a false wall. The chandelier in the main auditorium is the theatre centerpiece. It is 15 feet high and weighs 2,000 pounds. Following a $10 million restoration, the Orpheum re-opened in December 1993 with a concert by Heart and in January 1994 with the Broadway production of Miss Saigon. Productions that have originated at the Orpheum include Victor/Victoria, the pre-Broadway world premiere of Disney’s The Lion King and the national tour premiere of Elton John and Tim Rice’s Aida. Hennepin Theatre Trust is now the owner and operator of this magnificent structure. A variety of beverages including wine, beer and soft drinks and light snacks including cookies, are available for purchase in the theatre. No outside food or beverages are allowed in the theatre (unless required because of a disability or medical requirement). Our staff is committed to creating a safe and pleasant entertainment experience for all guests. Professional security personnel will be using metal-detecting wands and searching bags for prohibited items, so please plan to arrive at least 30 minutes in advance. All persons and bags will undergo electronic security screening at all entrances to the Theatre. For your own safety, sharp objects*, weapons and illegal contraband are not permitted into the venue. The items listed below, and any additional items that the Theatre management determines could potentially distract from the audience’s safety and enjoyment, are prohibited items which will not be allowed inside the venue*. The Theatre reserves the right to eject or bar entry to patrons who have such prohibited items in their possession. *Exceptions will be made for those with disabilities, medical requirements and/or special needs. Guests with specific/special dietary needs due to disabilities, medical conditions or special needs should contact email us or call: 612.339.7007 prior to attending the event to arrange for reasonable accommodations. Audio Description (AD) services are available by request for any event for our visually impaired guests. Actions on the stage are described by a qualified describer who uses a microphone and a wireless unit that is transmitted to a small device used by the guest to hear. Guests who would like to request this service are asked to allow at least two weeks advance notice to secure a describer. To order tickets to a currently scheduled Audio Described event, or to request an event be Audio Described, please contact the Box Office by email or by calling 612.339.7007.